At Pet Care Veterinary Hospital, regular wellness exams allow us to evaluate your pet’s general health and become aware of any problems before they become serious illnesses. We recommend that you bring your dog in every year for a wellness exam and lab testing until he or she becomes a senior citizen. Older dogs can see major health changes occur in a very short amount of time, so it is important that we see your aging pet more often. We will recommend how often based on your dog’s personal needs. Because we live in a high-risk area, we will ask about your pet’s exposure to fleas, ticks, heartworms, and intestinal parasites. We will develop an individualized treatment/preventive plan to address these issues. Vital statistics—One of our assistants will take your pet’s temperature, pulse, breathing rate, and body weight. If your pet has lost weight since the last physical exam, he or she may be experiencing the early stages of metabolic disease, such as kidney disease or diabetes. If your pet has gained weight since the last exam, our veterinarian will work with you to develop an appropriate diet and exercise plan to return your pet to a healthier weight. Ears—Your doctor may ask if your pet has been shaking his or her head or scratching at the ears, or if you have noticed an odor coming from your pet’s ears. Parasites and other foreign objects can easily make your pet’s ear canal their home. 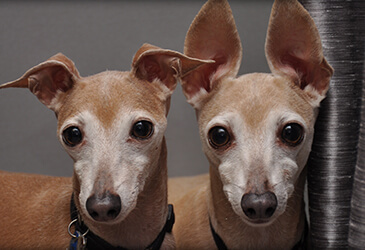 Your veterinarian will examine the ears to make sure they are healthy and critter free. Mouth—We will inspect your pet’s gums, teeth, tongue, and roof of the mouth for tartar buildup, dental abnormalities, fractures, loose teeth, tumors, infection, and other problems. Heart and lungs—Your doctor will use a stethoscope to listen to your pet’s heart and lungs for early signs of heart and respiratory disease. Reproductive organs—If your pet has not been spayed or neutered, we will discuss with you the many health benefits of spaying/neutering. Your doctor will check your pet’s reproductive system for swellings, discharges, and breast lumps. Skin—We will check your pet’s skin and hair for fleas, ticks, and other parasites, tumors, and wounds, as well as for signs of allergies, infection, and warts. Entire body—Your dog’s doctor will feel his or her abdomen for abnormalities, including enlarged organs, masses, or painful areas, to detect problems with the stomach, intestines, kidneys, liver, and other organs. The doctor will also examine your pet’s legs and feet and the condition of your pet’s joints, muscles, lymph nodes, and nose. We may also recommend additional testing to diagnose/verify a health problem or if any abnormalities are found during your pet’s examination.